Do you like Greedy Rabbit? Share it with your friends. 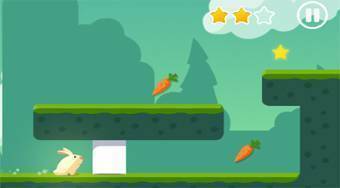 Greedy Rabbit is a great adventure jumping game in which you have prepared a total of sixty different levels of difficulty divided into four game worlds. In each round, skip the rabbit over the playing area, collect three pieces of vegetables (carrots, cabbage, eggplant, tomatoes), three gold stars, overcome all obstacles and get to the open portal.